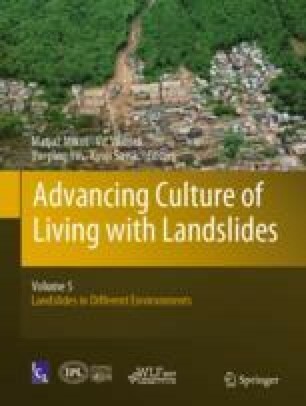 Spatially distributed physically based slope stability models are commonly used to assess landslide susceptibility of hillslope environments. Several of these models are able to account for vegetation related effects, such as evapotranspiration, interception and root cohesion, when assessing slope stability. However, particularly spatial information on the subsurface biomass or root systems is usually not represented as detailed as hydropedological and geomechanical parameters. Since roots are known to influence slope stability due to hydrological and mechanical effects, we consider a detailed spatial representation as important to elaborate slope stability by means of physically based models. STARWARS/PROBSTAB, developed by Van Beek (2002), is a spatially distributed and dynamic slope stability model that couples a hydrological (STARWARS) with a geomechanical component (PROBSTAB). The infinite slope-based model is able to integrate a variety of vegetation related parameters, such as evaporation, interception capacity and root cohesion. In this study, we test two different approaches to integrate root cohesion forces into STARWARS/PROBSTAB. Within the first approach, the spatial distribution of root cohesion is directly related to the spatial distribution of land use areas classified as forest. Thus, each pixel within the forest class is defined by a distinct species related root cohesion value where the potential maximum rooting depth is only dependent on the respective species. The second method represents a novel approach that approximates the rooting area based on the location of single tree stems. Maximum rooting distance from the stem, maximum depth and shape of the root system relate to both tree species and external influences such as relief or soil properties. The geometrical cone-shaped approximation of the root system is expected to represent more accurately the area where root cohesion forces are apparent. Possibilities, challenges and limitations of approximating species-related root systems in infinite slope models are discussed. We would like to thank the Federal State of Vorarlberg for providing remote sensing data and the Digital Elevation Model. Moreover, we thank our project partners of the BioSLIDE-project, Di Wang, Markus Hollaus and Norbert Pfeifer as well as the Torrent and Avalanche Control in Austria for supporting this study with valuable information and their expertise.